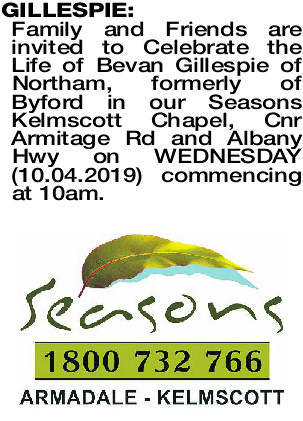 Family and Friends are invited to Celebrate the Life of Bevan Gillespie of Northam, formerly of Byford in our Seasons Kelmscott Chapel, Cnr Armitage Rd and Albany Hwy on W EDNESDAY (10.04.2019) commencing at 10am. 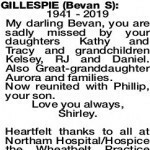 1941 - 2019 My darling Bevan, you are sadly missed by your daughters Kathy and Tracy and grandchildren Kelsey, RJ and Daniel. Also Great-granddaughter Aurora and families. Now reunited with Phillip, your son. 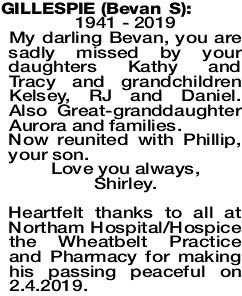 Heartfelt thanks to all at Northam Hospital/Hospice the Wheatbelt Practice and Pharmacy for making his passing peaceful on 2.4.2019. 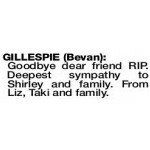 GILLESPIE BEVAN Dad you are finally at peace. Through the good and the bad you have always been there for me. You will be missed but never forgotten as you will always be in my heart. Love you always, Kathy Darrel and Daniel. 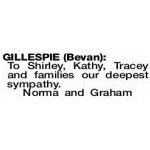 To Shirley, Kathy, Tracey and families our deepest sympathy. Goodbye dear friend RIP. 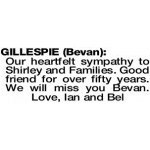 Deepest sympathy to Shirley and family. From Liz, Taki and family.